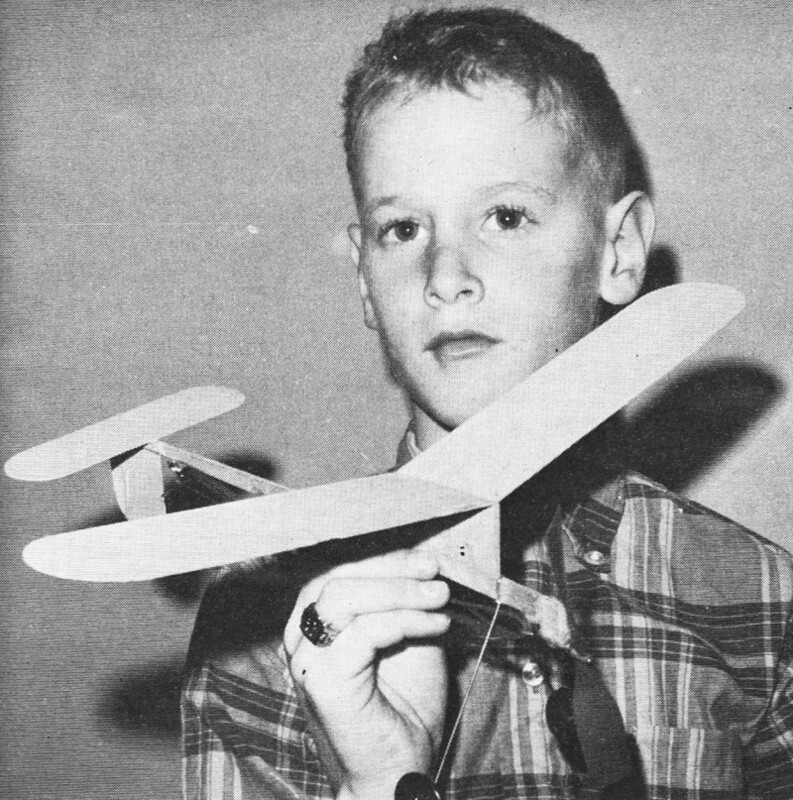 Website visitor Pat M. wrote to ask that I scan page 14 of this Hi-Climber article that appeared in the December 1968 edition of American Aircraft Modeler. I was glad to oblige, and while at it, I processed the entire article. If the rubber-powered free flight Hi-Climber interested Pat enough to build it, then chances are someone else might like to as well. 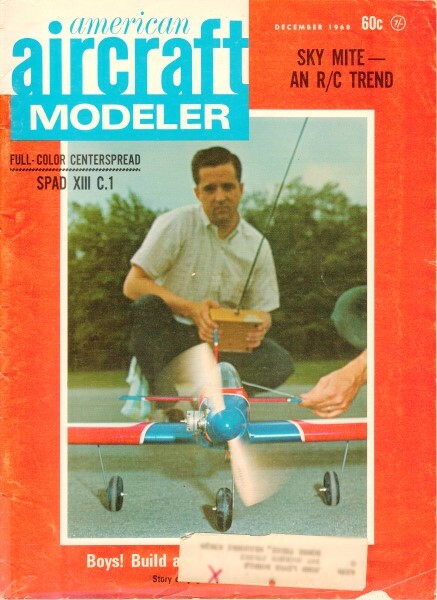 Hi-Climber is one in a long series of "For the Tenderfoot" models promoting the entrance of kids into the aeromodeling hobby. Here's a little cutie that really flies! It builds quickly and has almost no critical dimensions. It's designed like a contest model. And it flies like one! Plans are full size as they appear in this magazine. A few suggestions will help you get best results. Make sure you use stiff; warp-free wood for the wings and tail parts. 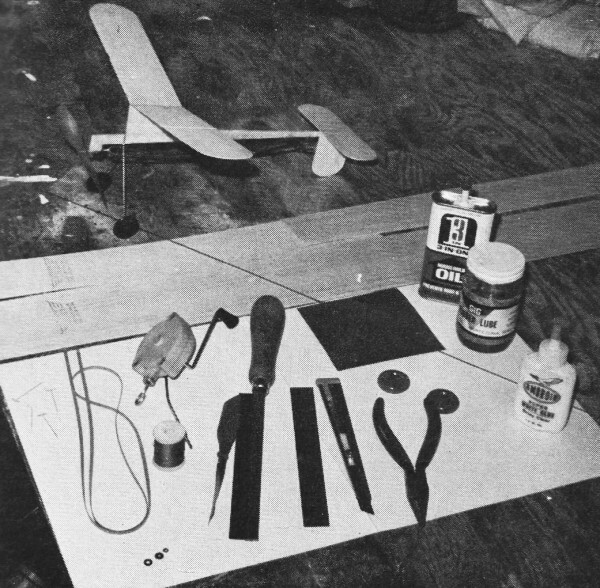 The propeller and wheels, along with wire parts may be had from the local hobby shop, or from some ready-to-fly models costing about 25c. Any plastic prop near 5 1/2 inches in diameter will do. They are easy to find. Study the pictures, tool list and materials list carefully before you start. Putting maximum winds to the motor by stretch winding will take some help from a friend, but flights will be about twice as long if you use a mechanical winder, or a hand drill with a hook in it. If you use a hand drill, put a slight bend in the hook where it fits inside the drill and get it tightened well so it won't pull out and cause an accident to your helper or the Hi-Climber . Everything you need, both in materials and tools. Razor saw is a help, but is not essential. Use of winder described in article. Parts have been cut out, landing gear bent to shape. 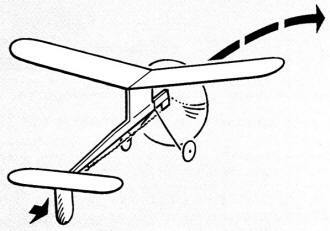 Important to note is simple method for putting the dihedral in the wing. You can add clay or chewing gum under a wingtip to control turns, as well as to the nose (if model stalls) or tail (if model dives) as necessary. All models built and shown in the pictures have required no such weight additions. 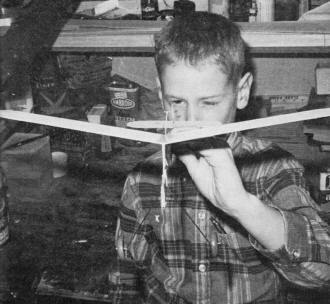 You can experiment by moistening lightly the rear of the rudder and bending it to either side to control the turns. If you wish to experiment further after building your Hi-Climber, follow step #20 and build one-half again bigger. Step 1: Make patterns of all balsa parts by putting tracing paper over the plans, or carbon paper and a sheet of white paper under the plans. Trace the outlines and cut out the patterns. 1. Trace paper patterns with carbon paper. Trace around patterns onto balsa sheet using ballpoint pen. Lines are easily seen. Step 2. With a ballpoint pen, trace around the patterns lightly onto the balsa wood. Step 3: Cut out the balsa parts using a ruler where needed to cut straight edges. Step 4: Sand all parts smooth and round except where parts join together. Step 5: Bend all wire parts to shape as shown on plans. Get help if needed. Put on wheels. Step 6: Glue wings together by putting one wing flat on the work bench and raising the other tip up 2 1/2 inches. 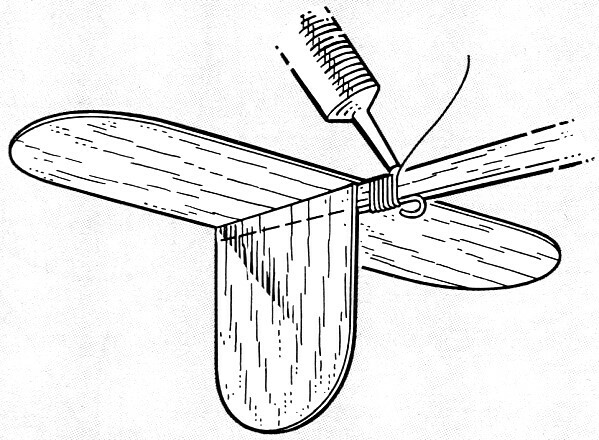 Use wax paper under wing joint to prevent wing from being glued to bench. This forms the proper dihedral angle and makes the Hi-Climber stable in the air. Let this glued joint dry overnight, or at least until thoroughly dry. 2. Prop one wing half up so tip is elevated 2 1/2" for dihedral. Cement halves together, using wax paper to prevent sticking to work board. When picked up, be sure bottom is dry. Step 7: Use a pin to make the hole for rear hook to fit bottom of fuselage. 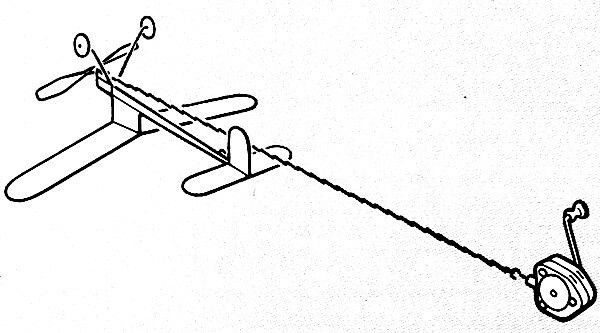 Push rear hook into fuselage and wrap joint with thread. 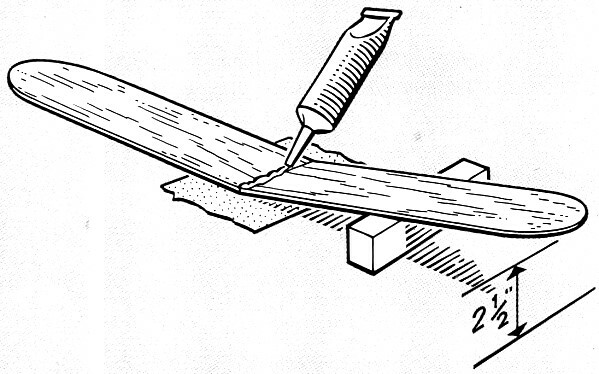 Coat joint lightly with glue. Step 8: Cut 1/2" length of metal tubing and glue it and spacer block to bottom front of fuselage. Wrap with thread and coat heavily with glue. If available, use epoxy glue on the nose rather than white glue (such as Elmer's). Step 9: Glue pylon onto fuselage and allow to dry. Make sure high side is forward toward propeller. 3. Cement wing pylon to motorstick, pinning it while cement hardens. Bind with thread and cement landing gear, spacer and thrust tube in place. It does not pay to hurry your work. Step 10: Put landing gear in fuselage, wrap with thread and coat with glue. Step 11: Glue stabilizer on top rear of fuselage. Use pins to hold temporarily if needed. Step 12: Glue rudder on either side of fuselage and against bottom side of stabilizer. Step 13: Glue wing on top of pylon. Use pins temporarily to hold in place if needed. Make sure all parts line-up when viewed from top, front and rear, and let the Hi-Climber dry thoroughly. 4. Bind and cement rear hook in position. Cement fin to side of motorstick. Make sure it is on straight as cement dries. 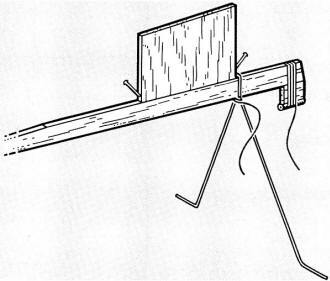 Step 14: Put propeller shaft through metal tubing, put on two or three thrust washers, put on propeller and bend end of wire to keep propeller on the shaft. Put one drop of oil on the washers only. Step 15: Lubricate the motor lightly with liquid hair shampoo or with rubber lubricant and hook in position. (Or melt a little margarine - not butter - in palm of hand.) Don't use oil on the rubber. Measure 3 1/2" of 1/8" rubber, tie the ends together and double the loop to make 4 strands. 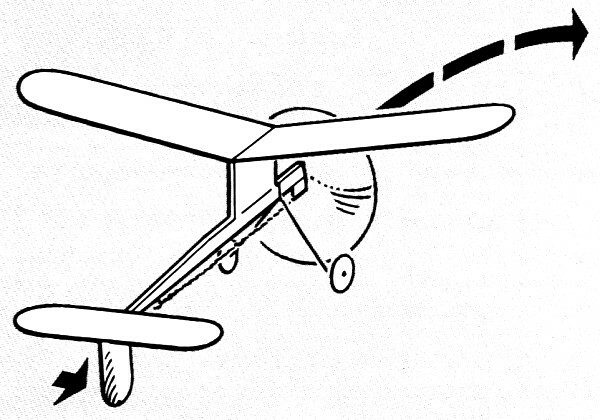 Step 16: Wind about 50 turns into the motor (don't wind backward; turn prop to right as you face front) and launch with a gentle push into the wind with the nose pointed slightly up. 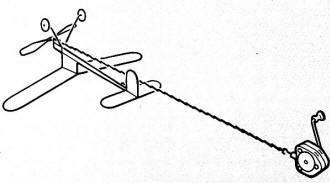 If the model turns too tightly to the right, moisten and turn the rear of the rudder to the left (as viewed from the rear). 5. Stretch four-strand motor three times its length to wind maximum of 250 turns with winder. "Walk" it in as you wind. Step 17: The model should circle to the right and climb high under power. In the glide it should turn to the left or possibly glide straight. 6. Bend trailing edge of fin in direction you desire model to turn. Breathe on wood, and bend gently while doing so. 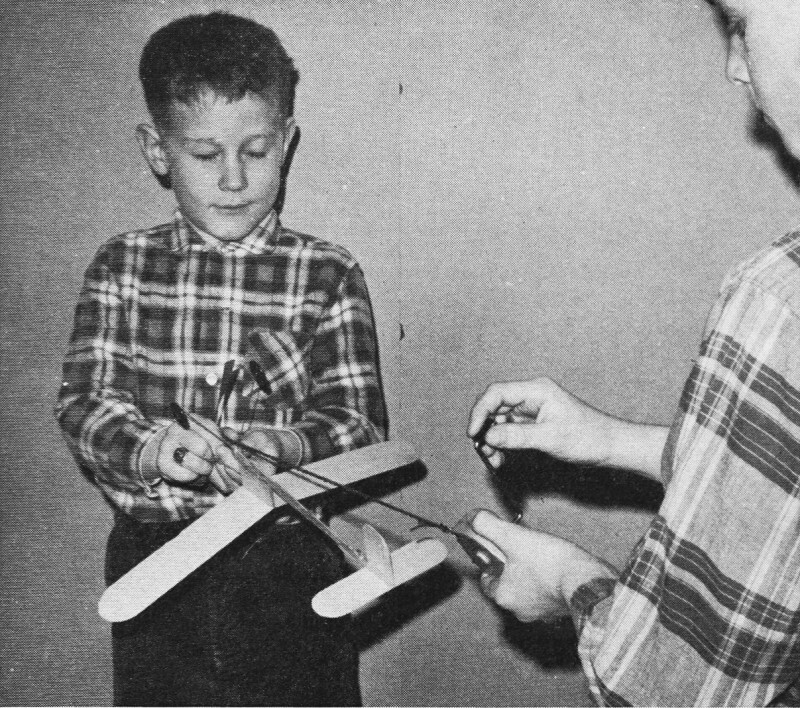 Step 18: Maximum winds are put in by following the picture which shows the model held upside down by the propeller while another person stretches the motor three times its normal length and begins winding while slowly advancing forward until normal motor length is reached. With practice, 250 winds of the motor are possible every time. This may only be 40 to 60 turns of your winder. See how many winds each turn of the handle twists into the rubber motor. Step 19: Fly the Hi-Climber away from trees and houses. It really goes! Your schoolyard makes a fine flying field. Use the ballpoint pen to put your name, address, and telephone number on the bottom of the wing for safety. 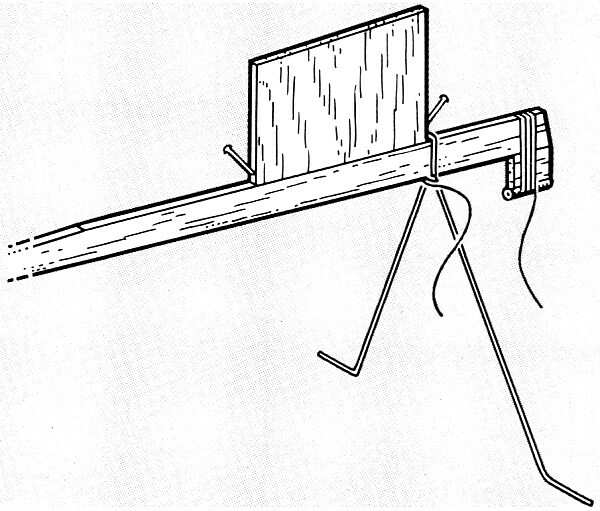 Step 20: You may wish to make a larger Hi-Climber by using wood twice as thick and making all parts half again larger than these plans. Be sure to keep the angle between the top and bottom of the pylon the same, as this is the only critical part. Step 21: Happy flying on calm days. Be patient if wind is blowing. An important part of building a flying model is checking out the alignment of flying surfaces. Should not be crooked - no warps! The secret of long, long flights. Use an escapement winder, or a drill with hook. Stretch rubber, wind and slowly walk it in. Modeling knife or single-edge razor blade for cutting. Ruler (a metal one would be best). Very smooth sandpaper (#500 or #400 if possible). Needle-nose pliers (for wire bending). Small hacksaw (to cut tubing). Pencil or ballpoint pen and carbon paper for tracing outline of balsa parts onto balsa wood. A few straight, steel pins. A sheet of tracing paper or carbon paper. One sheet 1/32 x 2 x 36" balsa. Must be stiff and flat. If not available, use soft, flat 1/16 x 2 x 36". 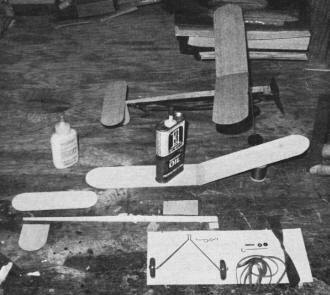 One sheet 3/32 x 2 x 36" very hard balsa for fuselage; 1/8" thick wood may be substituted. One piece 0.030 or 0.045 piano wire for landing gear and hooks. Two plastic wheels - about 1" in diameter. 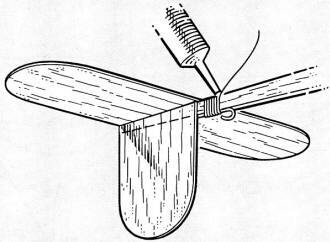 One plastic propeller 5 1/2" diameter. 5" may be substituted or a 6" propeller may be cut to 5 1/2". One 2 or 3 washers - piece of 1/8" flat rubber 36" long for 4-strand rubber motor. One piece of 1/2" long metal tubing big enough for the 0.030 or 0.045 wire to fit through - can be cut from inside a ballpoint pen. Small amount of liquid hair shampoo for lubricating rubber motor if model-type rubber lubricant isn't available. A winder for the motor. Use a small hand drill with a hook in the chuck, or use an R/C escapement winder. Some help in bending the small wire parts if you aren't strong enough. Drop of oil for the 2 or 3 thrust washers. Small piece of wax paper.